The EtherNet/IP communication network is based on the Ethernet and is considered a worldwide open standard in industrial communication. Furthermore, Ethernet /IP issupported by leading manufacturers and enables highly effective industrial data transfer in industry. Above all,the extension of Ethernet by the industry protocol makes Ethernet /IP suitable for industrial control technology. The industrial protocol - Common Industrial Protocol (CIP) - applies to applications in automation as application layer and transfers cyclic as well as acyclic parameter data. EtherNet/IP is standardized internationally, based on the standards series IEC 61158. In addition to PROFINET and Modbus/TCP, the protocol is one of the most frequent fieldbuses based on Ethernet. CID has an EDS (Electronic Data Sheet) as a configuration basis and shows an object-based character, so that the visible data can be reached as objects. While users familiar with Devicenet and Controlnet soon get along with EtherNet/IP, the reduced start-up times and the reduced engineering efforts are further advantages of the EtherNet/IP protocol. Characteristic for the EtherNet/IP protocol is an active star topology, where individual devices are connected via a point-to-point connection, which is done via a switch. This has the advantage that due to the star topology, operation of devices with transfer rates from 10 Mbps to 100 Mbps can be activated in the same network. EtherNet/IP further enables problem-free functioning of twisted pair and glass fiber cables. Not least, data collisions with simultaneous utilization of real-time applications are avoided with the help of the switch. The EtherNet/IP security permits defence against possible internal or external as well as unauthorized access into the manufacturing cell, Additionally, the control area and the information area can be separated from each other safely and conveniently. Furthermore, access to specific sources can be protected with passwords, packets not using CIP are blocked automatically and IT security measures can be implemented as required around routers, firewalls, VLAN, or VPN. The CIP extension also brings several safety advantages with it. For example, it is possible to assure functional safety and safe shut-off together. CIP Safety makes it possible to transfer safety and standard messages on the same network. The CIP protocol extension is standardized according to IEC 61508 / SIL 3, offers a Devicenet safety network and comprehensive safety and has integrated safety control. 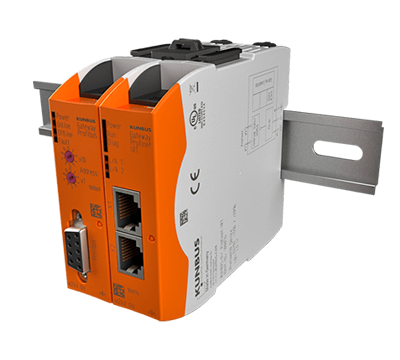 All field devices equipped with a serial RS-485 or RS-232 interface can be connected to EtherNet/IP networks. This requires only a protocol converter. This serves for conversion of the telegrams (RS interface) to messages (EtherNet/IP). In this way, it is not required to modify the electronics of the field devices in order to flexibly connect to a modern EtherNet/IP network.